Plan your next business meeting, corporate event or special occasion at DoubleTree by Hilton Hotel Philadelphia City Center. Located on the Avenue of the Arts, the hotel offers 27,000 sq. ft. of flexible function space, including our grand ballroom and junior ballroom. 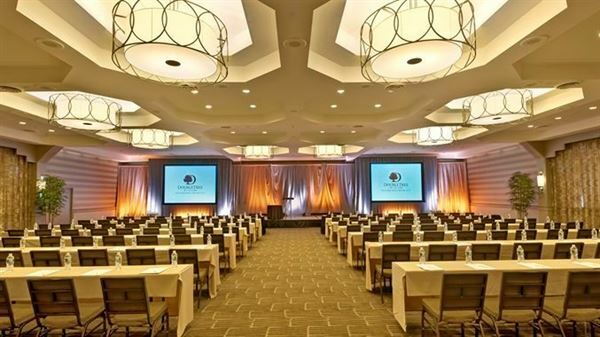 I wanted to highly recommend the Doubletree Hotel in Philadelphia if you are ever looking for a great venue in hosting a conference. We have been using them for over 5 years, and couldn't be happier with the service that we have received. First, the location of the hotel is absolutely superb it is located near most of the major tourist and shopping sites of Philadelphia, so people can easily find fun dinners and activities to do within walking distance in the evenings. Secondly, it's located near a food court and a couple of lunch places, which our respondents have said they really appreciated having close by. As for the service within the hotel, everyone is always responsive, and always ready to fix any problems as soon as the crop up. The conference facilities are not located on the same floor as the main lobby, which for us, due to privacy reasons, is an advantage. Overall, we thought that everything from the setup of the tables and chairs, to making sure our technology works is handled professionally, and I trust the staff at the Doubletree implicitly. After having used them for several years now, I intend to continue to hold our annual conference in their facility, and highly recommend them to others. Thank you for considering the Cottage Green for your next affair. We are happy to cater any function at our Northeast Philadelphia banquet hall whether it is a bridal shower, baby shower, graduation party, or any other type of special event. We also have the perfect setting for your next business meeting in Northeast Philadelphia as well! The Let Out is TempleTown’s newest event venue providing an unmatched experience of class, sophistication, and professionalism for your next gathering. Three open air spaces spread over two levels provides, both, the intimacy and atmosphere to make your event a success. From baby and bridal showers, to retirement and engagement parties The Let Out can tailor any package to meet your expectations. Services we offer include, but are not limited to: Full Service Catering Options Room Setup and Breakdown Dedicated Staff for each event Sound and Lighting Options Full Service Bar on each level The Let Out has an uncompromising commitment to provide a unique experience for any budget. Contact us today for a custom quote, tour of the facility, and additional information. Offsite delivery is available. The Lucky Dog Gastropub is a full service banquet venue, restaurant and bar. We have a liquor license. We offer award winning food as well as wine, spirits and beer. Onsite Catering is available in any of our four very different but equally beautiful rooms for company meetings or parties, holiday celebrations, awards ceremonies, baby showers, bridal showers, wedding rehearsal dinners ,birthday parties, anniversary parties, funeral luncheons, office meetings, corporate happy hour/cocktail parties, lifetime milestones and all other celebrations. Capture the moment in our newly renovated banquet room located on the second floor of The Lucky Dog. The room is handicap accessible and can hold up to 85 people for your event. It includes an elevator, private dining room, crystal chandeliers, a beautiful hand carved fully stocked bar, stacked stone fireplace and a private restroom. We also offer a smaller private room perfectly suited for meetings and private dinners, food and spirit pairings and wine tastings. (28 people or less). The Lucky Dog Gastropub boasts a large yet inviting dining room (seating capacity 100) that can accommodate large families and groups and a spacious yet welcoming bar room (capacity 117) that is great for happy hour gatherings.